In the center circle there is a color within a color. The outer color of the center circle represents the position of your cursor. 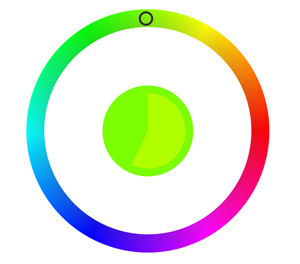 Move your cursor to a point on the outer ring that matches the color of the inner color of the center circle and click. If you move your cursor to a point where the inner circle disappears, that is a perfect score. The inner circle also serves as a timer. There are several rounds and all are played the same - match the color. I think I got a 3 something the first time I played, because I didn't understand the point. I played a couple more times and got up to 7 something. I'm just too slow. I can match the colors, it just takes me too long. Axe, there's a thing on there for colorblind people. I got .8, and I think that's probably pretty awesome. I tried it again without the Color Blind Assistance thing, and the first round never ended. I don't get it. You see it shows two shapes, and as you move the cursor, one of the shapes changes, right? When you get the two shapes the same, you have the colors lined up as well. In the latter rounds, the thickness of the lines of the shapes changes as well, depending on the cursor's position. I got 7.7, but I only got 6 on complementary and analogous. 10 on hue, 9 on saturation! I got 0 on Complementary and Tetradic. The others I did slighty better than average. When you get the two shapes the same, you have the colors lined up as well. In the latter rounds, the thickness of the lines of the shapes changes as well, depending on the cursor's position. Ooooh, look who can see colors gooood. But he got one pregnant by coming too soon. Or something. I wasn't entirely paying attention. I'd expect TFJ to do very well since he's doing that project. See that's a downside of doing stuff. People expect you to do stuff now. maybe I just have a well-adjusted monitor.